Chicken with Tarragon Cream, classic French from Thyme for Cooking. Heat butter in pot with a tight-fitting lid that is big enough to hold the whole chicken. Put the sprigs of tarragon or 2 tbs dried inside the chicken. When butter is hot brown the chicken on all sides. This should take about 10 minutes. Add the chicken stock and the white wine. Cover, turn the heat to low and let braise for at least 1 1/2 hours, the stock should be simmering around the bird but not a rolling boil. 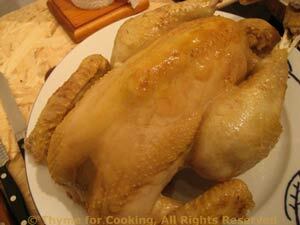 When chicken is done, remove carefully, it may be falling off the bone, cover and let rest. Scrape any bits off the bottom of the pan. Turn up the heat and boil 5 minutes until reduced slightly. Dissolve cornstarch in 1 tbs water. Add to simmering stock and stir until thickened. Add the yogurt / creme fraiche, heat through, then cover and keep warm. Cut the chicken into pieces and arrange on a platter. Pour some sauce over and serve, remaining sauce on the side. Note: Do not let it dry out, add more stock, wine or water if needed.